To most Americans, "Super Sunday" connotates the Sunday on which the NFL Super Bowl is played. However, in New Orleans, Super Sunday has a totally different meaning. 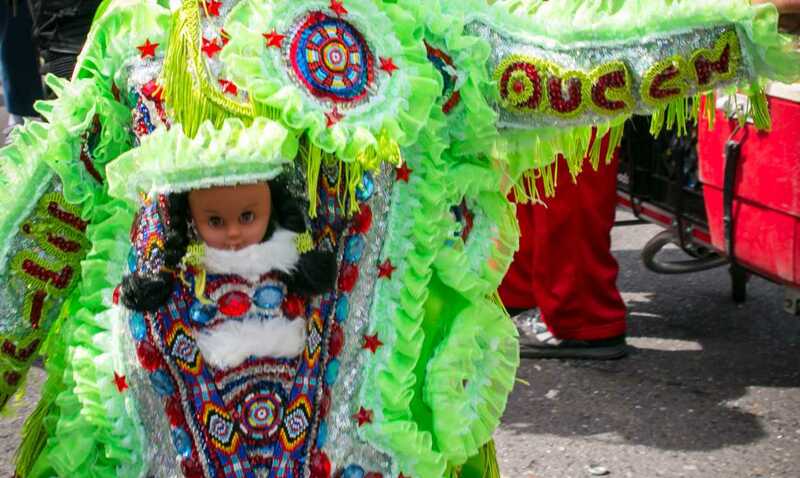 It is a day for the city's Mardi Gras Indian tribes to put on their colorful suits and "strut their stuff" while marching in a procession through the streets. In keeping with traditions that date back to the 19th century, New Orleansâ€™ Super Sunday is the Sunday closest to St. Joseph's Day (March 19). During their processions, the participating Mardi Gras Indian tribes, led by their Big Chiefs, often meet other tribes performing colorful dances, chants and other rituals. Each tribe and their Big Chief tries to outdo the other in a friendly competition witnessed by appreciative spectators. 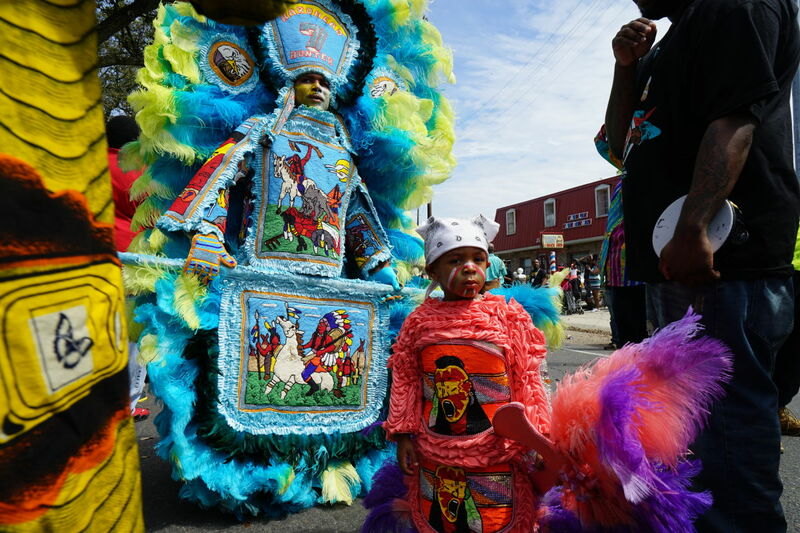 The largest and most popular of the Super Sunday festivities is the procession staged by the New Orleans Mardi Gras Indian Council in the Central City neighborhood, originating at A.L. Davis Park (Washington and LaSalle streets). Left at Martin Luther King Blvd. Another celebration takes place at Bayou St. John and Orleans Avenue in Mid- City, where the Tambourine and Fan organization stages its annual Super Sunday parade. 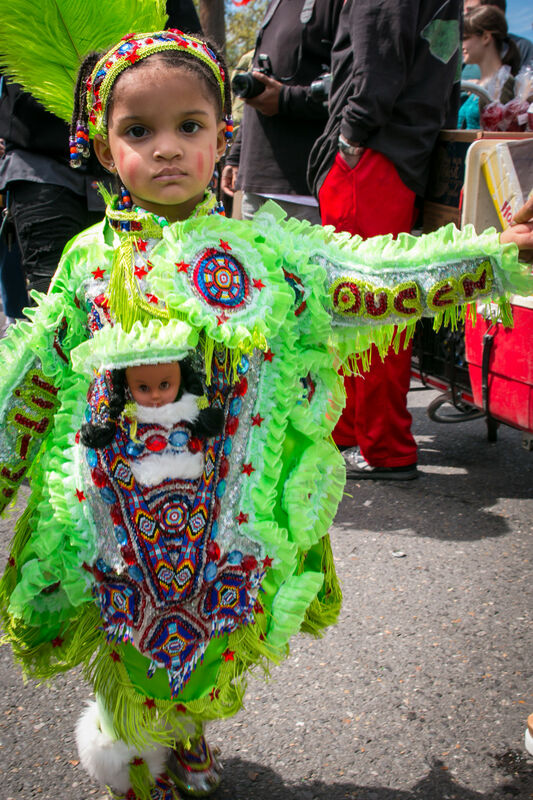 Various other Mardi Gras Indian gatherings and processions are also staged on Super Sunday at certain locations around the city, and there are related festivities at the Backstreet Cultural Museum in the city's famous Treme neighborhood. Check local listings as the date gets closer. All Super Sunday Mardi Gras Indian outdoor gatherings and processions are free and open to the public. Since 1970 they have taken place during daylight hours, which allows spectators to admire the beauty of the Big Chief's and tribe members' suits and the craftsmanship that went into their construction. 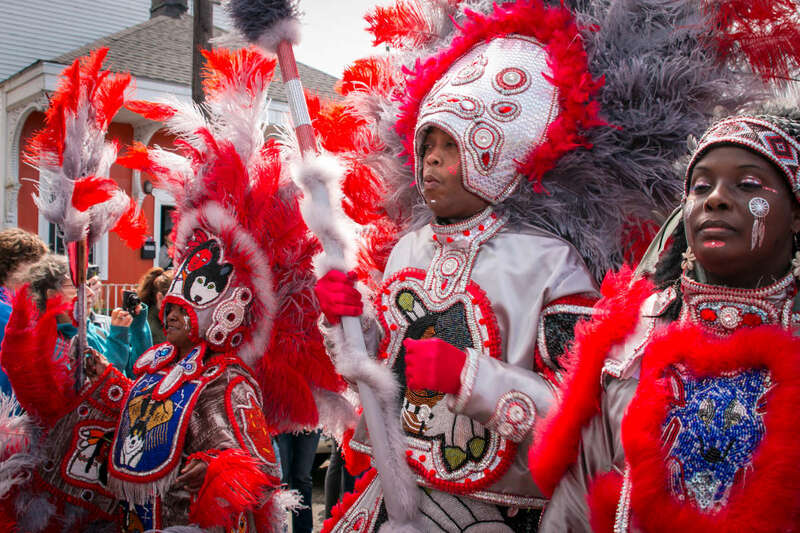 The Mardi Gras Indian tribes, numbering about 50, have many colorful names, originating in Native American tradition, and their chants and songs are rooted in tradition as well. 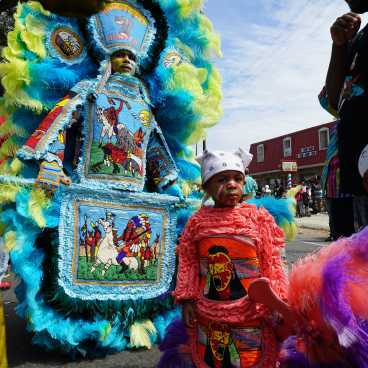 The Mardi Gras Indians' origins are believed to date back to antebellum times when escaped slaves sought and found safe haven among the various Native American tribes of the South. During the time these escaped slaves lived among the Native Americans they adapted some of their customs and later passed them on to succeeding generations. 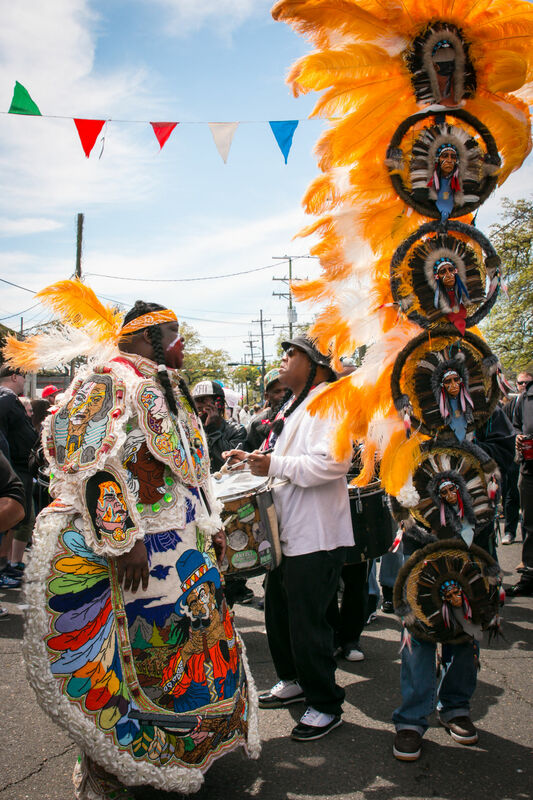 The tradition of Mardi Gras Indians masking on St. Joseph's day dates back to prior to World War I. Catholic Italians were celebrating the holiday, which allowed the Mardi Gras Indians to celebrate more discreetly. Their night celebrations turned into a day parade on Sunday afternoon in 1970. In the late 19th century, it was difficult for African Americans to be part of Mardi Gras parades and balls, which led to the creation of the Mardi Gras Indians. They paid homage to their Native American comrades by creating the elaborate feathered and beaded suits. The suits worn by the indians are entirely hand-sewn, incorporating brightly-colored feathers, beads and glittering sequins and rhinestones into a dazzling panoply of folk art. They are made up of a crown, dickie and apron. The beads are sewn together in a pattern on the front of the suit and apron to depict an illustrated theme, most often dealing with a historic or folkloric event. The suits, which are only worn twice a year during Mardi Gras and Super Sunday (plus occasional special events like JazzFest) can weigh up to 150 pounds. The Big Chief's headdress alone may weigh 50-75 pounds. Each year a new suit must be constructed, again entirely by hand, while the previous suit is dismantled. The suit is usually created in patches. No sewing machines or other mechanical devices are used, and the drawings are done freehand and not by computer. Creating an entire suit takes six months to a year to complete.